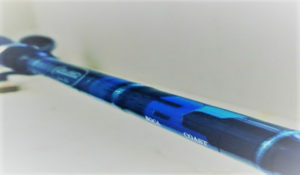 Dan James Custom Rods: Whether you're fishing Inshore or Offshore, fresh or saltwater, you want the best spinning rod you can buy for the money. Snook, Redfish and Tarpon around the flats of the Boca Coast don't care how fancy your reel is, as long as it has a good drag they'll take it. The Goliath Grouper and monster Amber Jacks are going to put so much torque on that rod it's going to look like you snagged a runaway chum train. And that Bass you waited your entire life to catch, shouldn't be trusted to the cheap pole and reel combos from Walmart. The rod you choose to engage your trophy fish with is the first, and by far most important connection you have when the hook is set. It has to have a strong back bone to pull them out of the cover, it can't snap under heavy loads and yet a sensitive tip to feel that cautious bite can mean the difference between hanging that bad boy on your wall or going home skunked. Wishing you had invested in a quality rod while trying to pull what's left of your snapped rod out of the water, isn't something you'll likely do twice. Do yourself a favor and get the right tool for the job now. You'll be glad you did for years to come. The Best Inshore Saltwater Rod and Reel Combo? This is one of the most popular questions we get. When it comes to the rod, the answer is simple. Our professional charter captains and inshore fishing experts agree. A 7 foot 6 inch rod, with medium weight and fast action is the way to go. Aside from having your name and logo added to the shaft (very cool), the details you get in an inshore rod from Dan James make a tremendous difference. Reel seats dramatically change the look and feel of a rod. They use all sorts of styles from solid aluminum Alps to Pacific Bay skeleton seats. Their most popular is the Aero seat. With a raised ridge that fits the palm of your hand, you can feel the control and comfort with every cast. You can order it with stylish look that comes with all black accessories or spruce it up with a silver hood. Comfort, durability and fishability is the reason anglers order these reel seats so often. We ordered our BC inshore DJ rods with this raised grip and it fits perfectly into the palm of your hand over the reel. When casting, fighting or even working the bait, this is like cruise control on your car. Once you experience it, you'll never want anything else and wonder how you ever fished without it. The Best Inshore Saltwater Reel: Quantum Cabo PT; Our top choice for 2015, 2016 and 2017. When it comes to the reel you choose, the details and build quality are what makes the difference here as well. The most important feature of your inshore reel to combine with your rod is the drag system. Spinning or bait casting is a preference in your technique, but the equipment has to be able to take the level of abuse these fish can put out. It's not so much the number of pounds of drag it can produce, it's all about the number of times it can do it. We're talking about the material of the drag system itself. The drag system on a reel is very similar to the brakes on your car. Get spooled by a 40 inch snook a few times and that cheap cork drag is going to be burnt, slick and consequently not work the way it should ever again. So what's the best kind of drag system on an inshore reel? Answer: Heat-dissipating materials like ceramic, stainless steel and carbon fiber. Unless you plan to catch guppies, you'll want a saltwater reel with a drag system that can take the heat and stand up to corrosion like your rod can. A 40 or 4000 (same size) is the best size for most inshore fish, but Tarpon isn't called the silver king for nothing. A 60 or 6000 reel and 8 foot Heavy Fast action rod combo will be called for to pursue them. Supplemental build materials that stand up to corrosion from salt and harsh environments are also important. This will increase the cost up front, but the number of years you get out of this combination will likely save you money in the long run because they will last and not need constant replacement. Conclusion By Dan James Custom Rod Company: From our production line to our fully custom rods, we have the right blank and hardware for every individual fisherman. Whether you're pulling plugs through the lakes for bass, ripping top waters with long distance casts. Tossing live bait under the mangroves for snook. Popping a cork on the flats for redfish. Pulling Goliath grouper the size of your boat from the depths. Fighting the tarpon in Boca Grande pass. All the way up to the unlimited series for giant tuna and shark. We make it ALL! Not to mention we are very proud of our rods. 100% made in America. Better yet made right in Fort Myers Florida. We will never sacrifice quality for quantity. We will always produce right here in the USA. Dan James Rod Company is privately owned by a veteran. So pride and integrity is built into every rod. To set up an in store consultation or to place and order please call 402-310-7607. Brady Nelson will be happy to assist you. Happy fishing friends!